By Taylor Miller on February 10, 2013 Visit Taylor's Website. I’m so honored to share this exciting news with all of you! 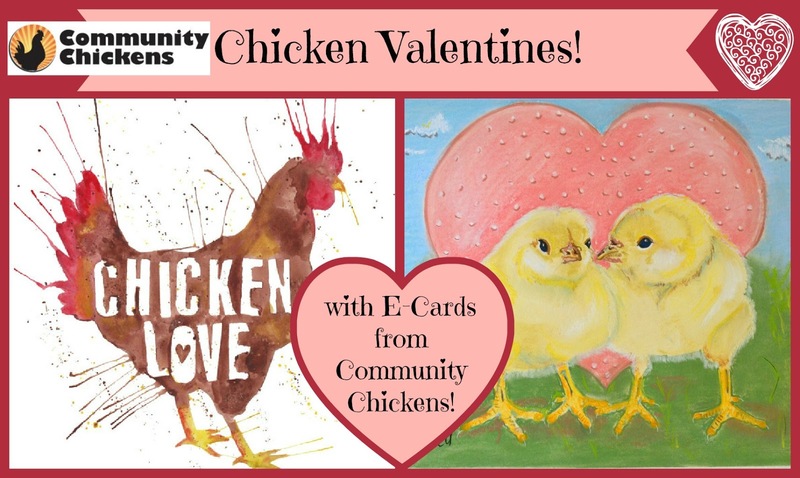 Community Chickens is proud to announce a new line of chicken themed E-Cards available to YOU, our valued readers! 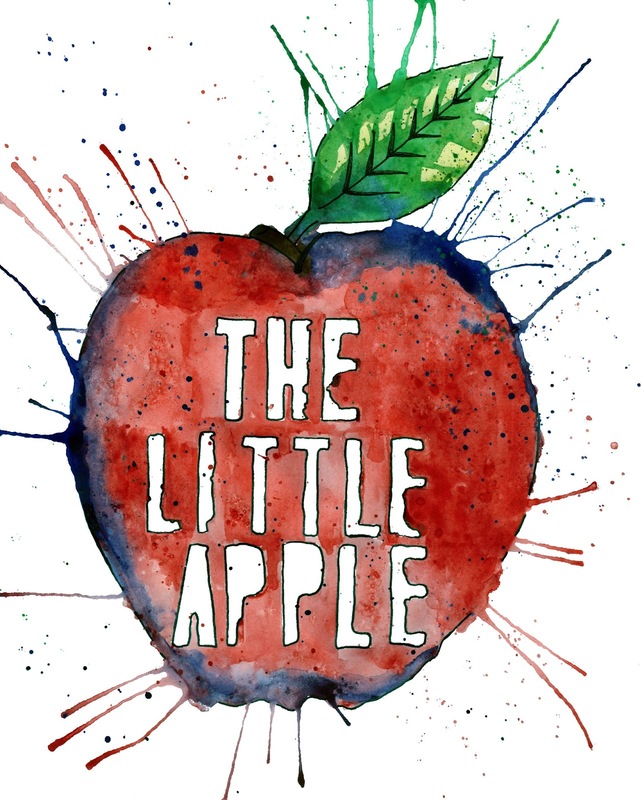 The artwork that appears on the cards was designed and created by the gifted and talented artist Lindsey Bugbee and myself, Jennifer Sartell. To send your sweetie a FREE E-Card simply click HERE! 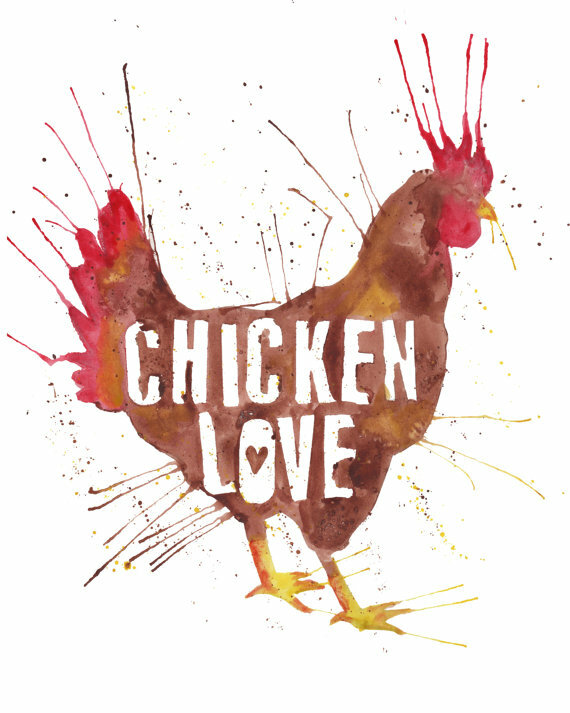 There are 9 different chicken themed images to choose from, and 17 backgrounds! Then personalize it with your own heartfelt message and send it! Your Valentine will be able to view their Valentine in their inbox! 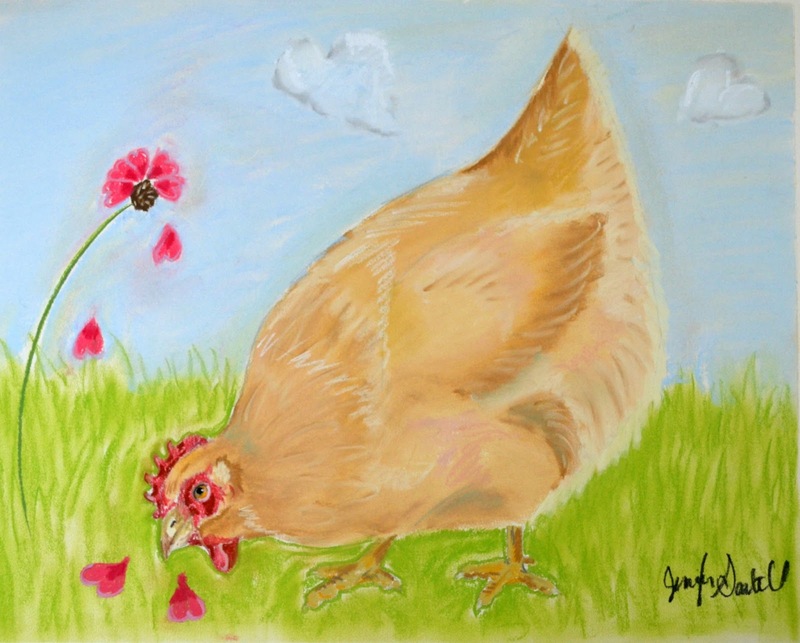 What’s even MORE exciting, is that Lindsey is generously giving away a beautiful original watercolor “Chicken Love” to one random reader! Details at the bottom of the post! 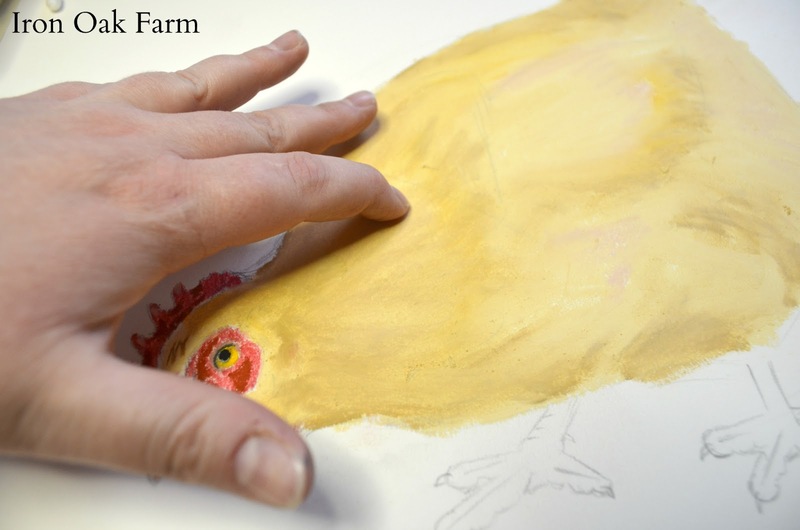 Because Community Chickens believes in creating a sense of community and sharing, we thought you might like to know a little bit about us, the artists and the process of how these E-Cards were created. 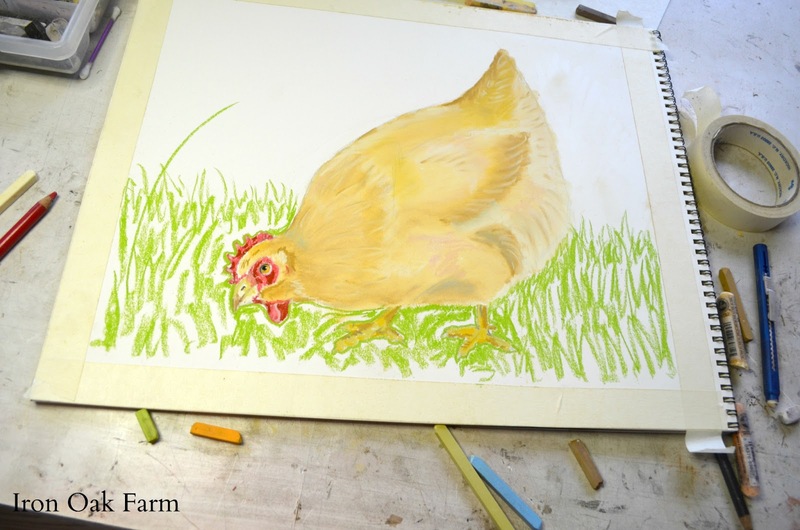 Here is a brief story of Lindsey and my art process, how we became artists, and how chickens and farm life has inspired us to create! I can’t remember a time when I didn’t enjoy drawing. Throughout my life I would doodle, draw and sketch on anything I could get my hands on. On scraps of napkins at restaurants, in school when I should have been doing work, or on recipe cards as I waited for things to bake. I also can’t verbally explain anything without getting a pencil and paper and drawing it out for the person, because evidently speaking the idea doesn’t work for me. A few years back, before I was married, I started drawing commissioned pet portraits. The job sort of found me. I did a few drawings of our own pets for Christmas presents, and family and friends saw the portraits and asked for their own animals and children to be drawn. Quickly, word spread and it took off. 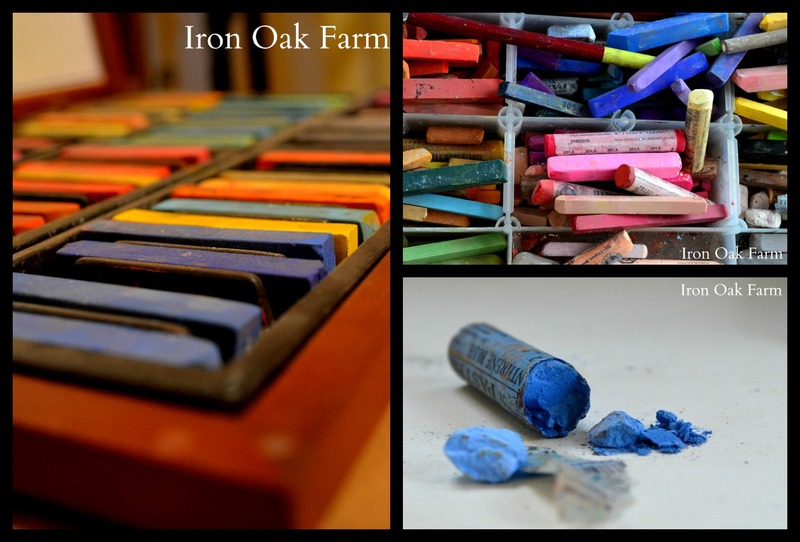 I started an Etsy site, Iron Oak Farm and was overwhelmed with orders. I did portraits full time for about 3 years and then lots of “life” happened. 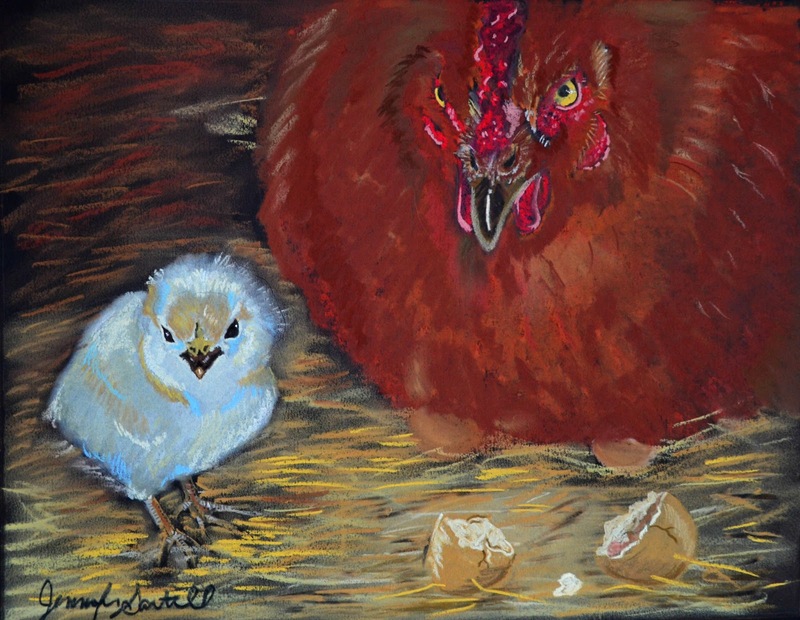 My father, who was also an artist, passed away, we moved to our farm, and my art fell to the back burner. It was a weird time for me, I buried myself with the work of the farm and in so many ways it was a blessing that kept me busy…moving forward. But at the end of the day, where I used to sketch or draw, I was exhausted and feeling less than inspired to create. This winter, I tackled some of the boxes still packed from the move. Subconsciously, I knew what was in those boxes and they had stayed packed up for a reason. It was a lot of my dad’s art work, paintings and pads of sketches, journals he had doodled in and the technical drawings he did for his job. It was an emotional strip of packing tape to cut, but after I let the tears fall, I felt inspired again. I wanted to create, to keep his legacy going. 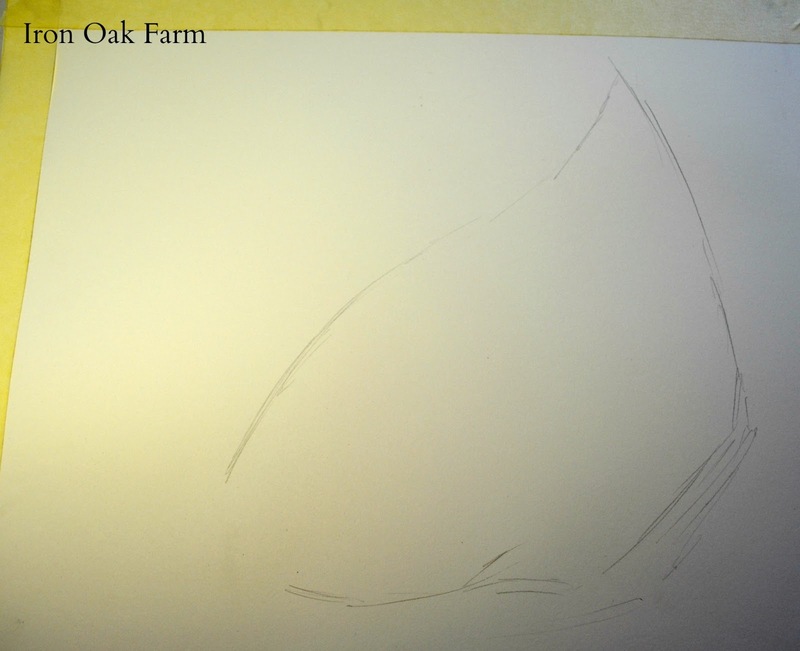 I started drawing things around the farm. 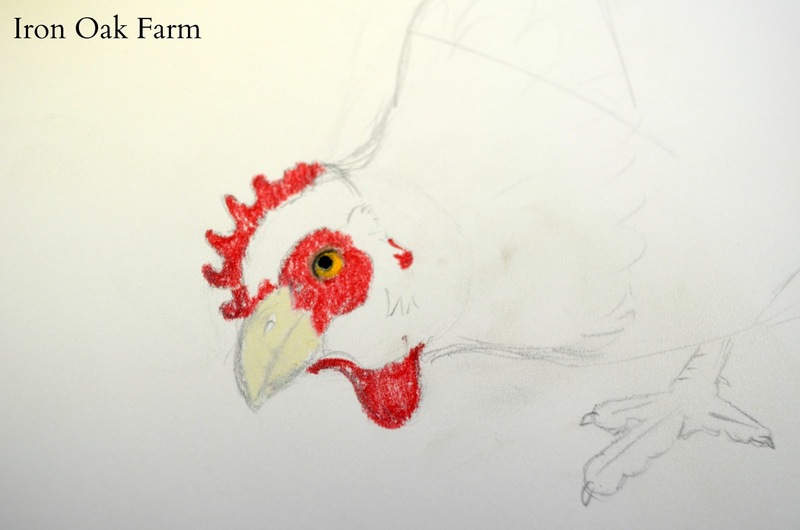 First our goat Sulley, and then of course chickens! Lots of chickens! 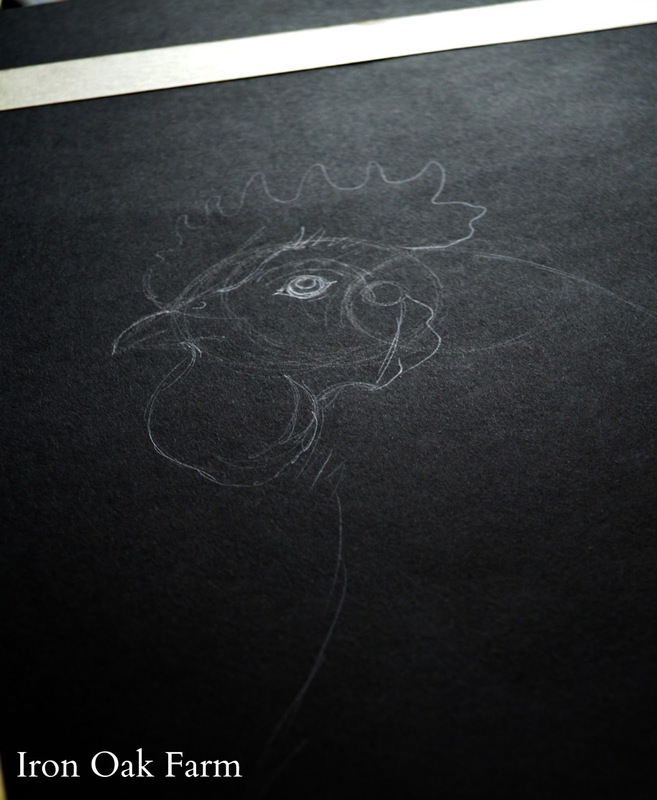 I’d like to take you through my process of drawing a chicken. This is a loose sketchy sort of drawing that uses simple shapes and large blocks of color. But it’s whimsical and fun! 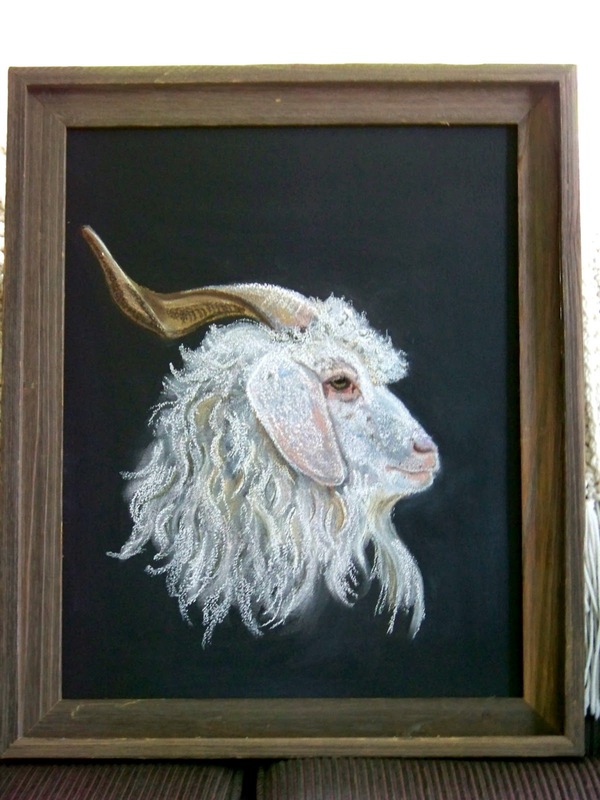 My preferred medium is pastels, chalks and charcoal, I like the blend-ability that the powdery sticks provide. I also like that I get to use my hands and fingers to spread the medium around. But in the same note, I tend to be really messy. I’m using a heavy stock drawing paper with a medium grip, which just means is has a bit of a toothed texture to hold the chalk to the paper. I’ve also been experimenting with black paper and drawing on chalkboard. Kinda fun! 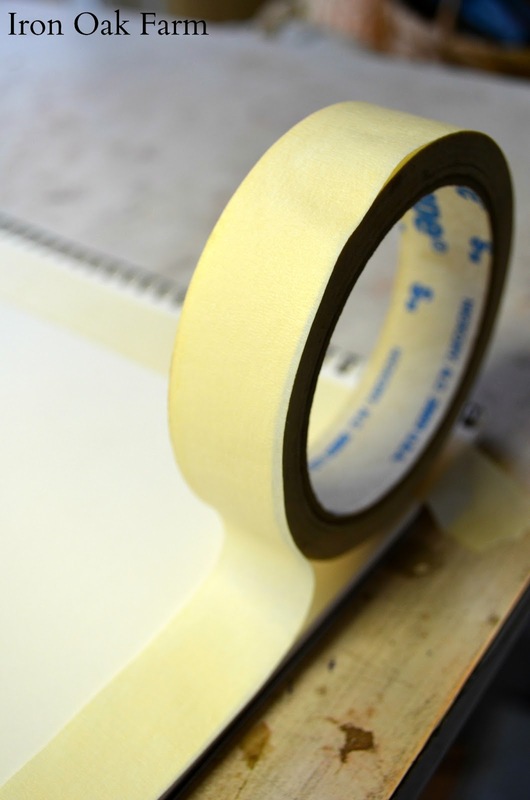 I start by taping off the edges of the paper with masking tape. After the drawing is done it will give a nice clean outline ready for framing. 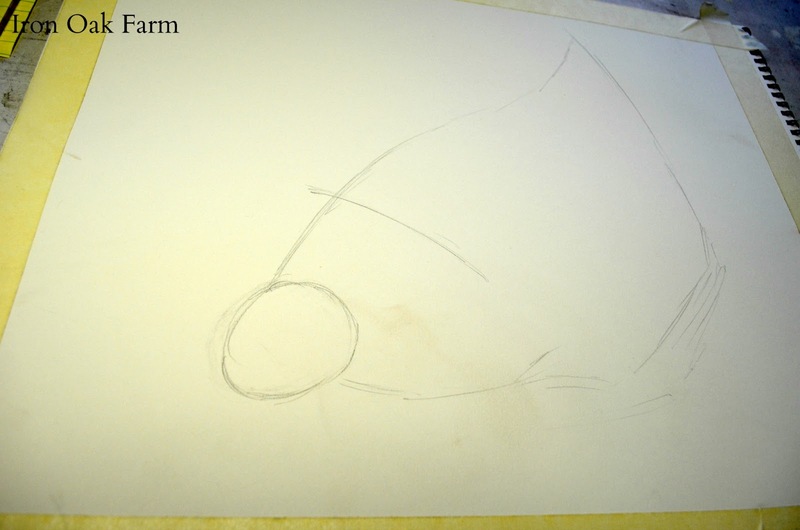 Then I sketch out the basic shape with a pencil. Even the most complicated subject matter can be broken down into basic shapes. 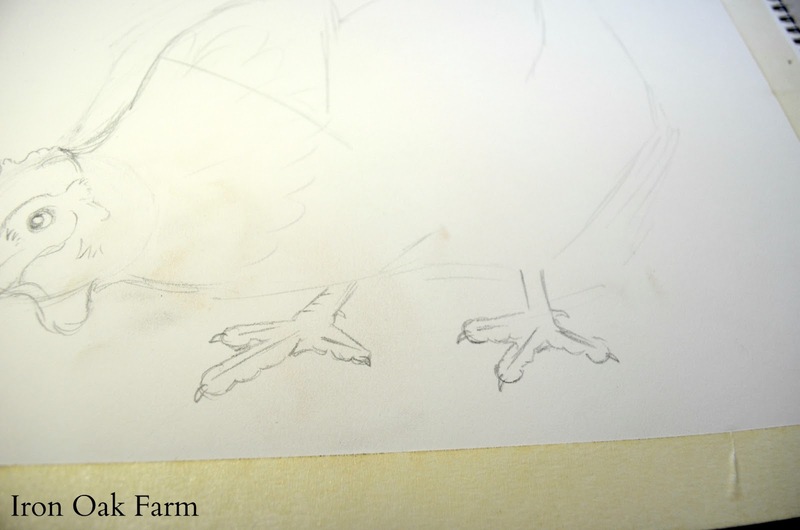 The chicken tail is a triangle, the body is sort of football shape, etc. I try not to push too hard with the pencil because graphite is slippery and the chalks don’t stick to the pencil lines. 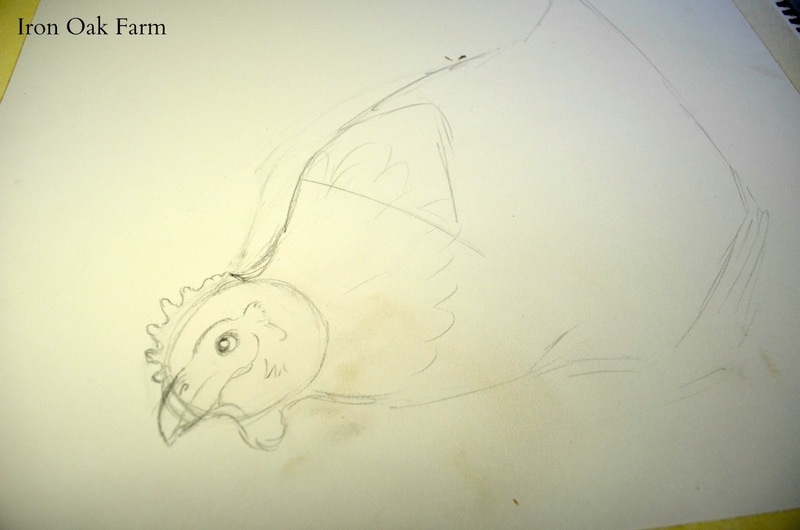 The chicken head is an oval, then the chicken’s back sort of flattens out across the wing “shoulders, so I draw a guideline to help me remember that. Then the details with the face. The line where the upper and lower beak meet is almost in line with the eye. 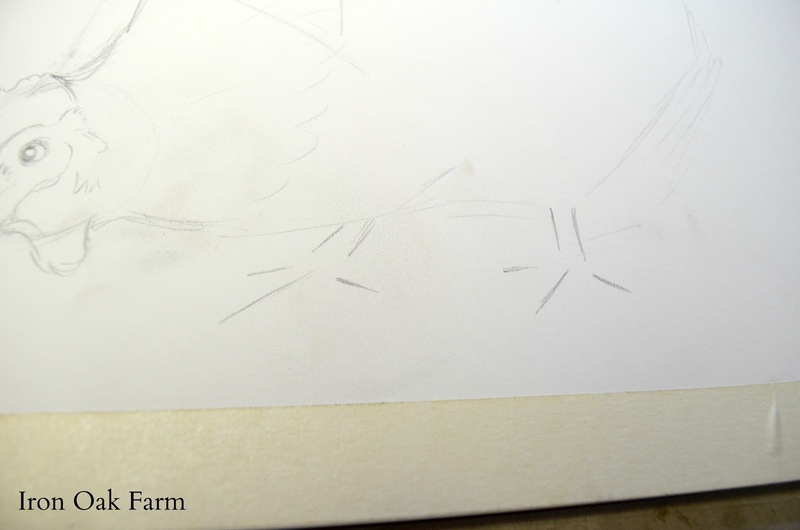 The basic shape of the feet. Her forward foot is angled more so the front toe appears longer. Then putting the “skin” on. The toes are rounded on the bottom and fairly smooth on top, with a bit of webbing between. Now for some color! She’s going to be a Buff Orphington so golds, oranges, cremes and peaches. The blues are for shadows. To prevent “flatness” use the opposite color in the color spectrum for shadows. Blacks and greys are blank colors and I try to avoid them if I can. I always start with the eyes. I feel like they’re the hardest to get right. So if I mess up, at least it’s early on and I can start over without losing much work. I also try to layer the lightest colors first. She’s starting to get her “Buff” on. 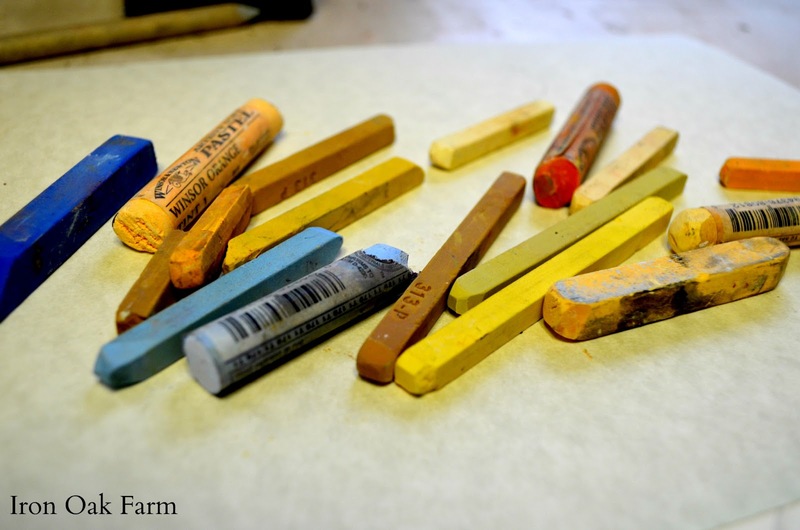 Pastels leave a powder when you scrape the stick across the paper. I leave this powder until the area is covered because it will help blend the color over large areas. Almost filled in. I work the chalk in the direction that the feathers grow. Adding some shadows and peach to warm the gold colors. Then blending it all together. Once it’s blended I can go back and deepen shadows and add highlights to give dimension. And the feet in shades of yellow, orange and a warm grey. A lot of artists start with the background and then put the foreground on top. That makes sense, but I seldom ever do it. I never know what the background will look like until I get the main object down. 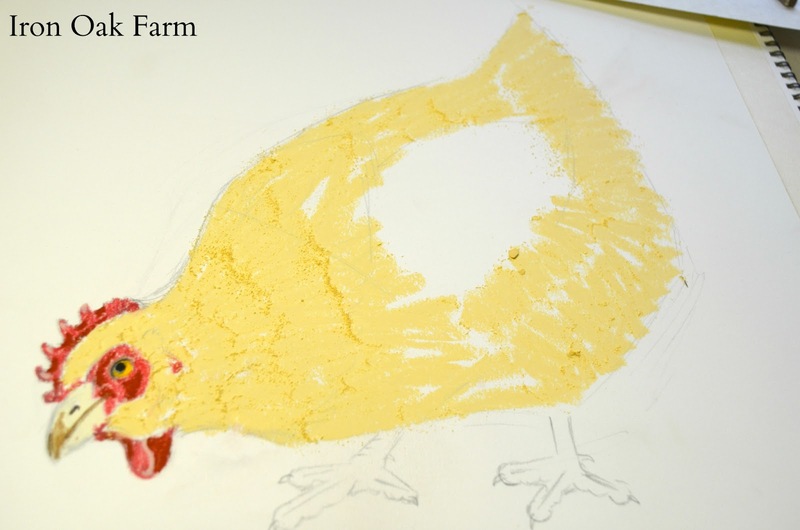 To view more examples of my work and chicken prints for sale, visit our Facebook Page or our Etsy Shop, Iron Oak Farm. How/when did you become an artist? I know this is a cliché answer, but I’ve always been very “in” to art. I grew up on a relatively isolated farm just on the outskirts of Gem, Kan. (a town of around 80 people in Western Kansas), so when I was little, it was imperative that my brother and I find things to do to amuse ourselves. My parents were pretty laissez-faire, so I’d draw on the walls of the unfinished rooms in the old country house, or I would shut myself in the sewing room and narrate stories out loud as I drew them. One of my absolute favorite things to do was go out to our dirt/sand mixture driveway after it rained and draw out floor plans with a stick. My imaginary houses got pretty elaborate with Victorian couches and canopy beds! When I started going to school, I remember we would have tether ball tournaments and the winner would get one of my drawings. In short, I’ve always loved art and it’s been a beloved past time for me. 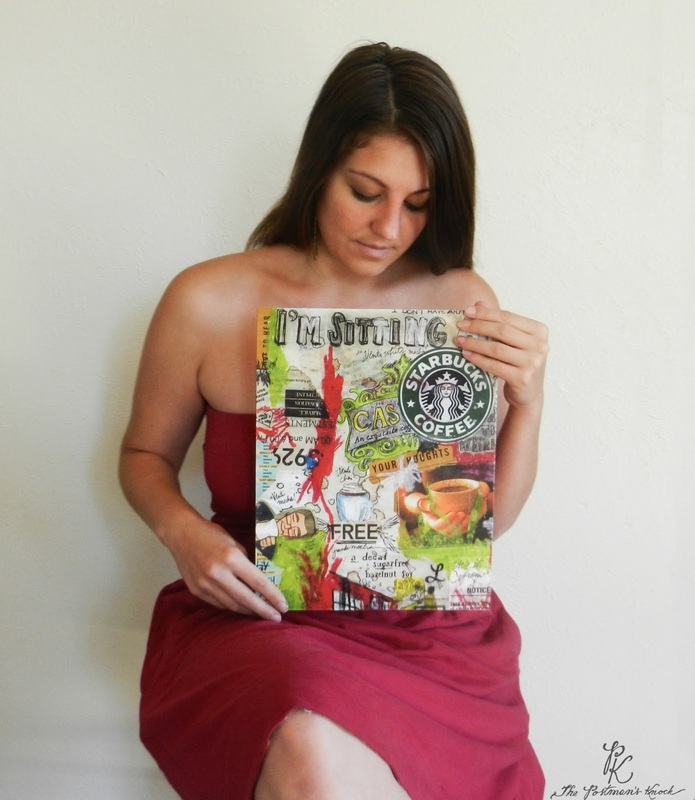 What is your history, your story of where you are now with your art/business? I continued to love art throughout high school, and my works won awards at many art shows — and I even got a silver key award at a national level through the Scholastic Art and Writing Awards! One of my batiks toured New York City for two years; it was very exciting. Curiously, however, when I began college at the University of Kansas, I didn’t turn to graphic design, illustration, or painting. Instead, I chose to pursue an English major. It was a nice break, I suppose, to be challenged on a linguistic level, and I really do believe that language and art go hand in hand because the ultimate goal of both is to describe a concept or idea. I enjoyed my time at the University of Kansas immensely, but when I graduated I faced the dilemma that most liberal arts graduates face: what now?? For a couple of months, I sort of “floated”, applying to jobs that didn’t seem to suit my skill set — more to validate the value of my college degree than anything else. Eventually, I took a job as an office manager at a medium-size start-up in Boulder, Colo.
For the first few weeks in my new occupation, I was just thankful to have a job. But as time went on, I realized that the job didn’t utilize any of my skills. I wasn’t using my linguistics, and I certainly wasn’t using my art. I felt bored and unstimulated; I wanted to be anywhere but my desk. I jumped at any chance to leave (I had many doctors’ appointments and lunches out), and when I was at my desk, I watched the clock on the lower right side of my screen with desperation. I knew that something had to give, but I couldn’t imagine a way out. I toyed with perhaps getting another 9-to-5 job, but I balked at the idea. I wanted to work from home and own my own business, like everyone else in my family. In September of 2012, I opened a shop on Etsy, The Postman’s Knock and put a few of my designs in it: baby shower invitations, logo design, and calligraphy. The response was very encouraging, and as I worked with more and more clients, I realized, “Whoa — this could be my happy reality.” My significant other, who is a master programmer, began working on a website for me The Postman’s Knock.com, and I started to take my Etsy business more seriously. In November of 2012, I handed in my resignation exactly one year from when I had started the job, and I stopped having to be at a place that felt toxic to me. The Postman’s Knock became my new job, and while I work many more hours now for less money, the happiness it brings me is so worth it. It’s wonderful to be able to do what you love, and I always get a feeling of exhilaration when someone purchases something from me or reaches out about a custom project! 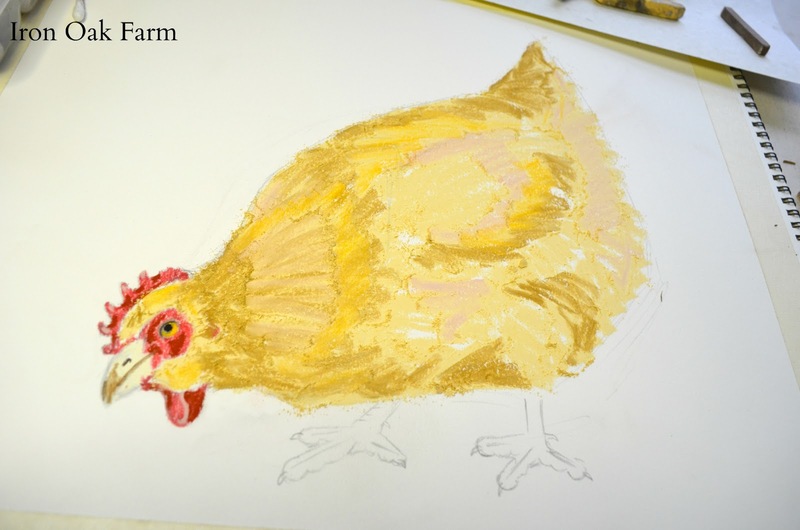 Do you raise chickens and if so, have they inspired your art in any way? I wish I raised chickens! Unfortunately, Boulder apartment life isn’t conducive to tending chickens. Someday, I’d very much like to live in a house that is self-sustainable (with wind power, a well, hay bale insulation, a garden, and animals), and goodness knows nothing tastes better than a farm-fresh egg. My link to Community Chickens is through growing up with Taylor Miller, Community Chickens Editor and through having interned at Mother Earth News — which is also owned by Ogden Publications. 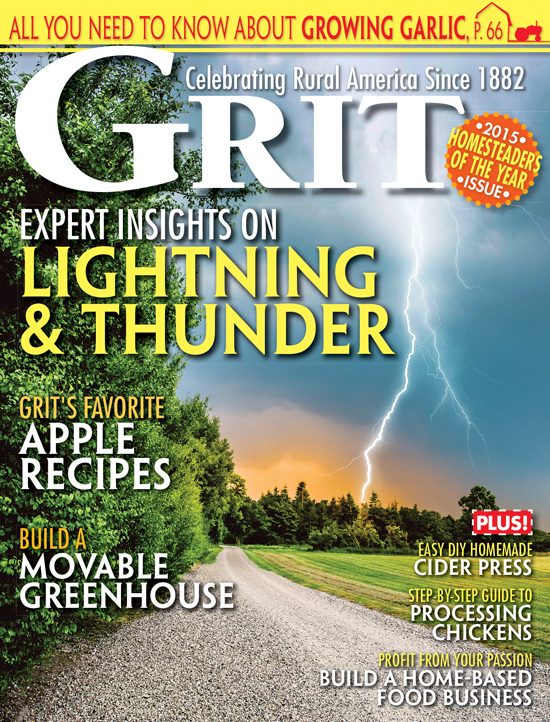 Though I am not an intern there anymore, I still blog for Mother Earth News and love it dearly! 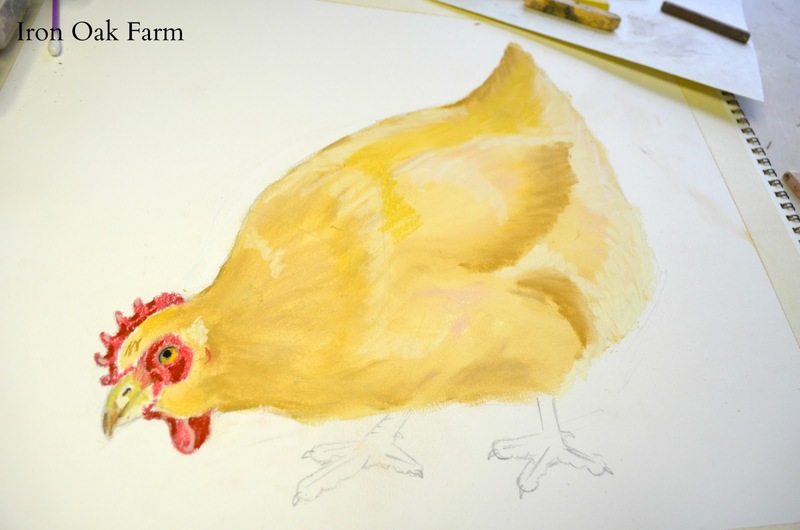 Despite not raising chickens, I have been inspired by chickens in my art — especially in creating materials for Community Chickens. 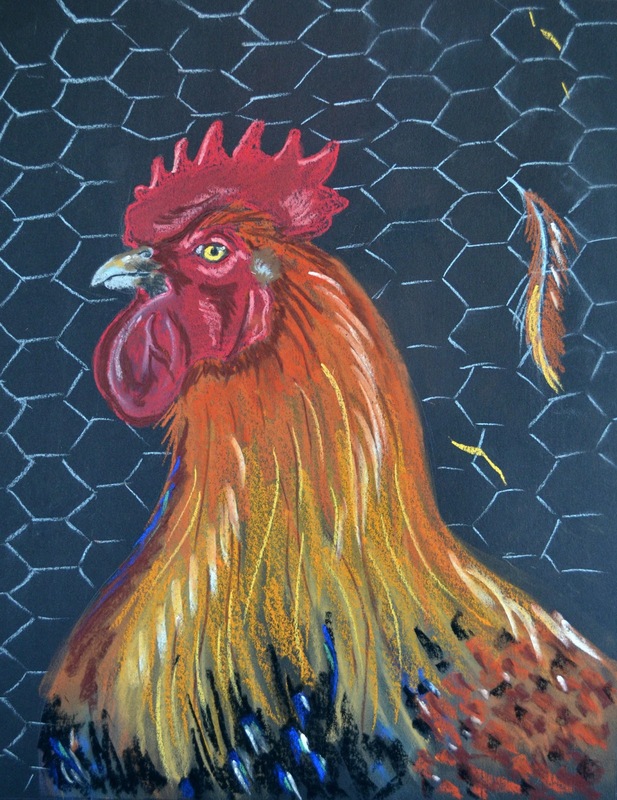 Before creating any of my works for Community Chickens, I created a Pinterest Board called “Community Chickens” with chicken art that I love. 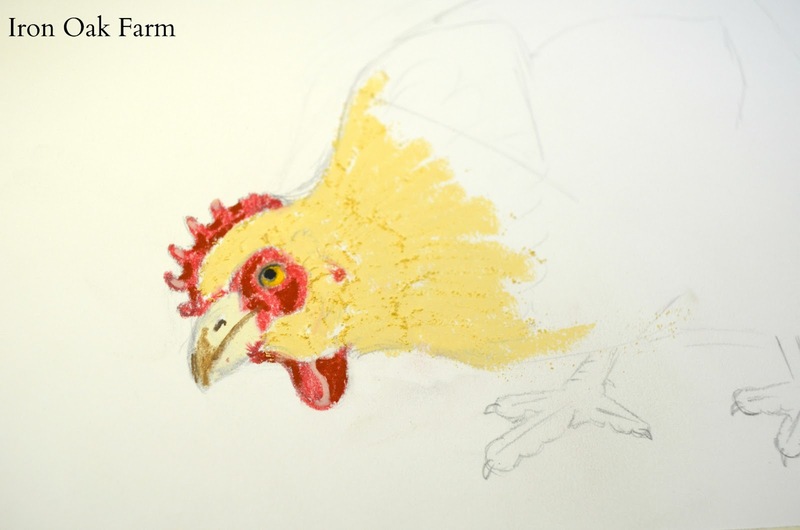 Chickens really are beautiful creatures, majestic and dignified (sometimes in a funny way), so they are fun to depict with artistic means! What does inspire you/help you generate ideas? Pinterest is a fantastic resource if you’re feeling uninspired (whether you are looking for art techniques or the latest and greatest technique for cleaning out your garbage disposal). I am also very much inspired by clients who reach out with project requests … some of my most popular works have been born out of a project request that I wouldn’t have thought of myself, but the client asked for certain elements to be brought together that just “worked”. 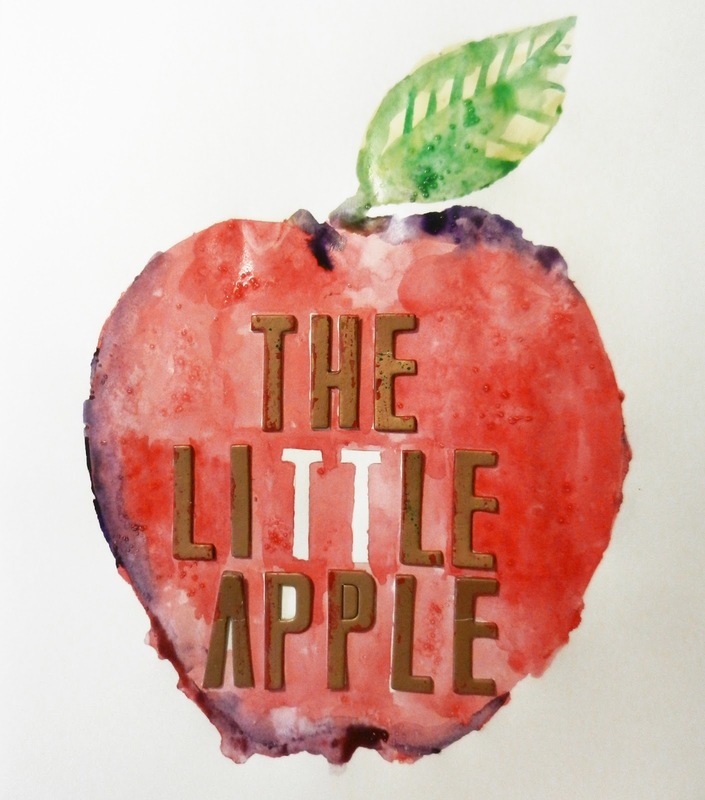 When I’m feeling out of ideas, I’ll ask a friend if s/he is hankering for a certain subject or piece of text to be portrayed, and then I will depict said subject, send the original to the friend, and put a print of it on Etsy. 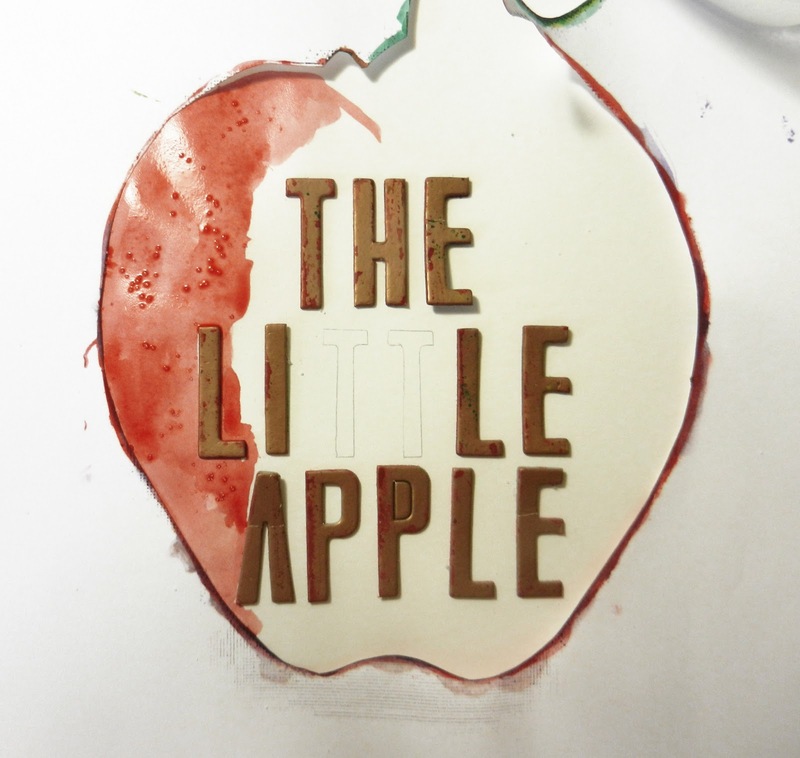 I really like creating tutorials (link to: http://www.thepostmansknock.com/tag/tutorial/) on my blog, so I am always looking out for ideas as far as things I can create. Our visit to Kansas last weekend, for example, found me listening to my sister-in-law talking about how she sewed tea bags for her family as Christmas gifts. I thought, “Brilliant! 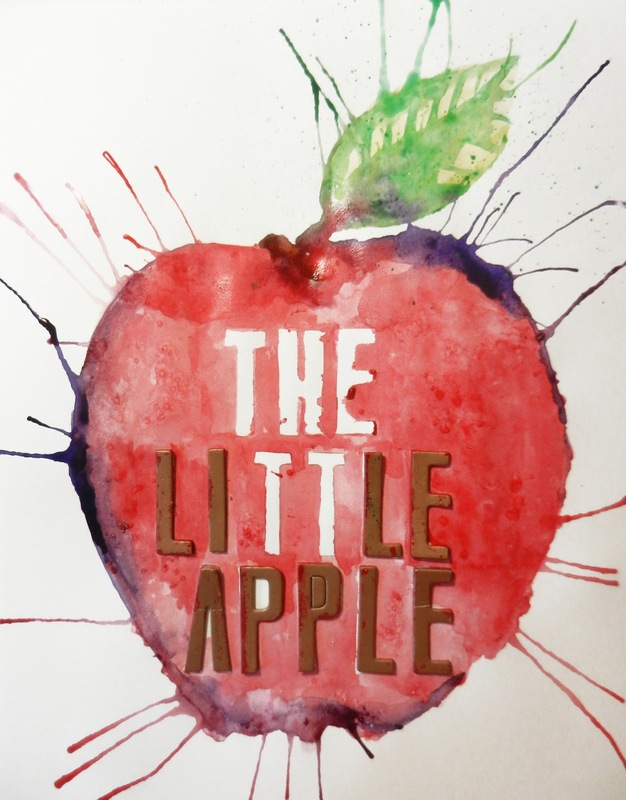 I’m doing a blog post over that.” Inspiration is everywhere, you just have to look and listen. Any information about your process. I have so many different processes, you’d get bored reading about them. 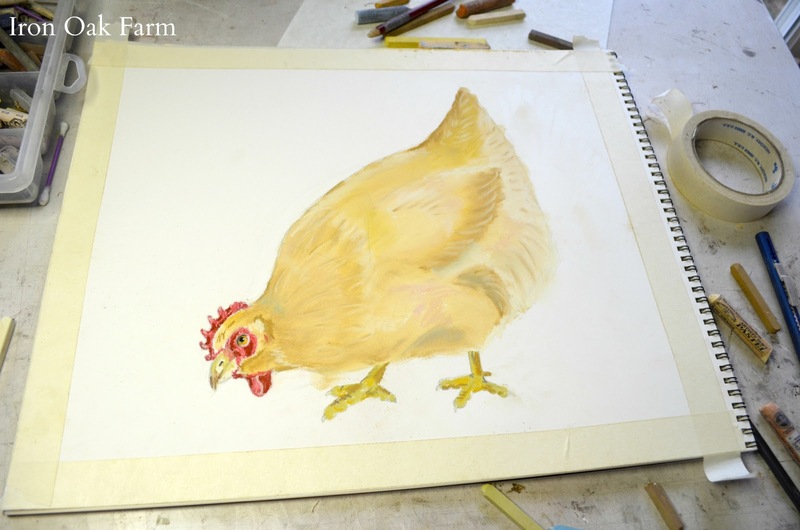 But, included throughout the post are photos of my energetic watercolor painting process, which is how I created the watercolor “Chicken Love” chicken that is featured in the giveaway! 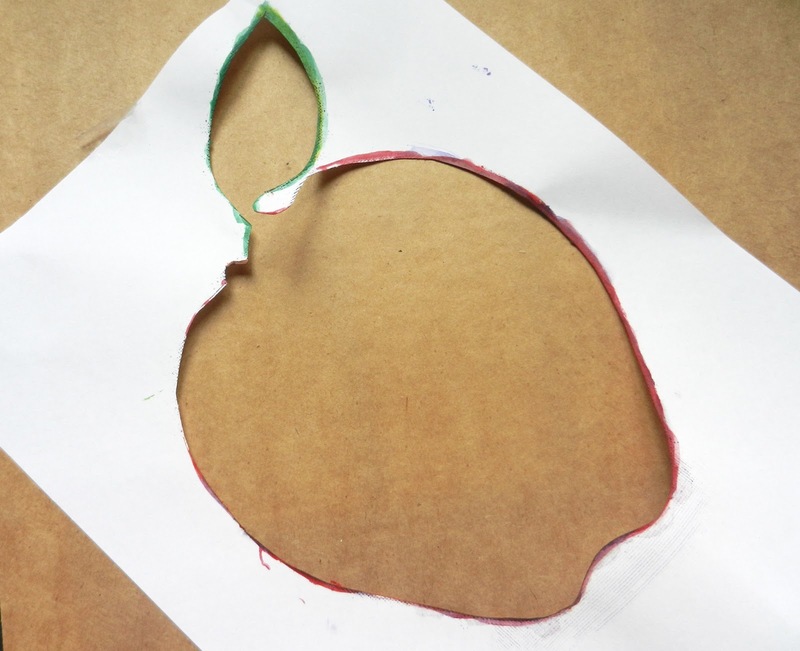 The process begins with a stencil that I create by drawing an outline of a shape (in this case, an apple). 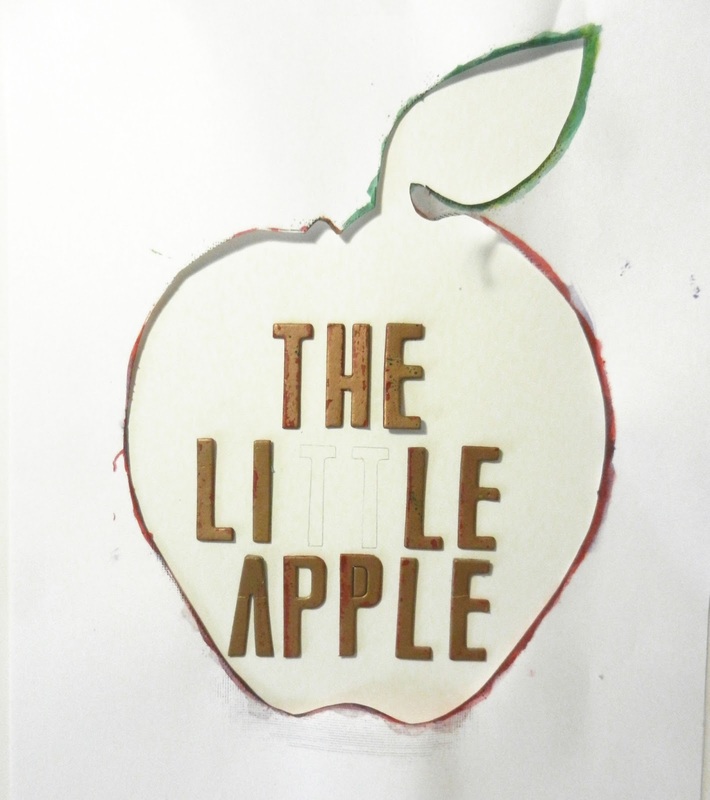 Then I cut out the stencil with a hobby knife. 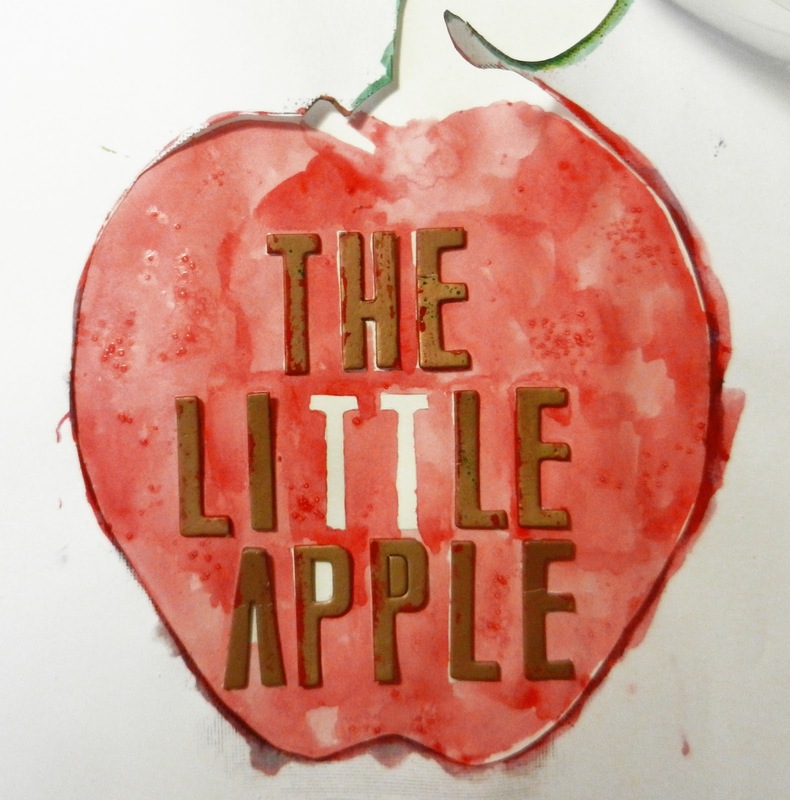 After that, I lightly tape the stencil down, lay down letters inside of it if I want to convey a message (these particular letters came in a scrap booking kit — and “The Little Apple” is Manhattan, Kan.), and I go watercolor wild. One of my favorite things to do with watercolor is sprinkle salt over the top when it’s still wet. It creates great texture! After I have filled in the whole thing, I remove the stencil. Usually some paint has seeped outside of the stencil, so I blow on that to create fun paint runs. Then I use my thumb and the paint brush to playfully flick some color over the finished work. This particular work also needed some tracing with black ink. Another one of my favorite processes is my crayola crayon portrait process, which I have written a blog post (link to: http://www.thepostmansknock.com/how-to-create-a-crayola-crayon-portrait/) about. It’s incredible to watch simple pencil drawings evolve into colorful and realistic likenesses! Honestly, I love creating art with anything (except for clay — I’m awful with 3D stuff). I have created batiks, paper mosaics, complicated pencil drawings, watercolor portraits, acrylic portraits, calligraphy art … pretty much everything 2D. If you’re curious as to what I’ve been working on lately, check out my Facebook page (link to: https://www.facebook.com/ThePostmansKnock). Wow! Very impressive blog I like it……….